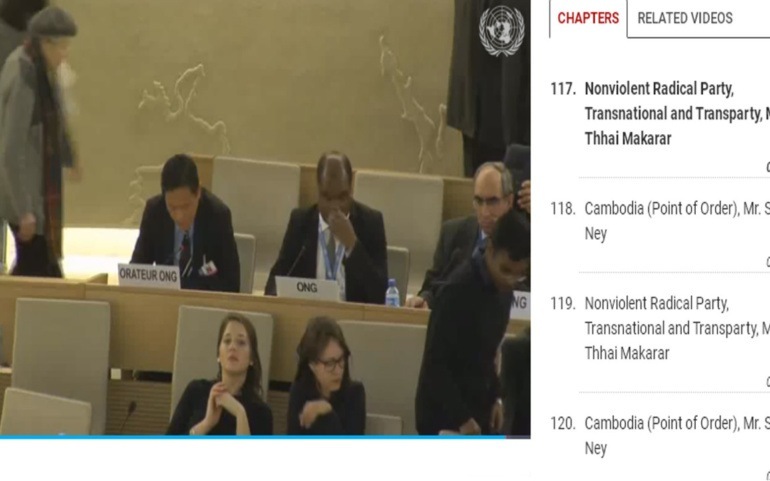 On Thursday, March 22, Makarar Thhai took the floor in the UN Assembly of the 37th session of the Human Rights Council, on behalf of the Nonviolent Radical Party Transnational Transparty (NRPTT). Thhai is a member of the dissolved Cambodia National Rescue Party (CNRP), the main political force of opposition in that country, founded by Sam Rainsy and outlawed on November 16, 2017 with a politically-motivated decision by the Cambodian Supreme Court at the behest of Prime Minister Hun Sen, in power for 33 years. Shortly after taking the floor to speak out on the repression in his country and the rigged elections scheduled on 29 July, Thhai’s speech was disrupted. He was interrupted four times: twice by the Representative of Cambodia and two more by the Permanent Representatives of the People’s Republic of China and Venezuela. Only the interventions of the Representatives of the United States, Australia and Norway allowed the speaker to conclude his speech, albeit reduced since each NGO is allocated two minutes. The previous day Chinese dissident Jianli Yang, member of the NRPTT and honorary member of the Global Committee for the Rule of Law “Marco Pannella” had been interrupted by the Representative of the People’s Republic of China. The following is the full text of the speech Makarar Thhai delivered partially. Since the Cambodia Supreme Court dissolved the CNRP (the main opposition party), some lawmakers and other officials have fled Cambodia out of fear for their safety, while several members of commune councils have taken refuge in Thailand and other countries. Others who have remained in the country have been subjected to harassment and bullying by authorities. Recently, a Cambodian court is taking action against five top former opposition party lawmakers and officials (Mr. Sam Rainsy, Ms. Tioulong Saumoura, Ms. Mu Sochua, Mr. Eng Chhay Eang and Ms. Kem Monovithya) for continuing to conduct political activities outside the country. Because of the political persecution of the opposition party, NGOs, and independent media, the civil society groups in Cambodia are very concerned that the national elections that will be held on 29th July 2018 will not be free and fair. While the election of Cambodia’s leaders is a matter for the Cambodian people, the United Nations should support the principles of free and fair elections, a robust political system with a viable opposition, and the right of the Cambodian people to elect a government of their choice, in which they have a legetimate voice. Therefore, the Secretary General of the United Nations should make the request to the Co-Presidents (France and Indonesia) of the Paris Conference on Cambodia to take immediately the appropriate measures, in accordance with Article 29, to bring Cambodia back to path of democracy and human rights. Thank you Mister President for your attention.